Cohen told ABC News on Tuesday that he was asked by House and Senate investigators “to provide information and testimony” regarding communication he has had with people connected to the Russian government. “I declined the invitation to participate as the request was poorly phrased, overly broad and not capable of being answered,” Cohen said in an email. ABC News noted that after Cohen declined to cooperate, the Senate Select Intelligence Committee voted last Thursday to give the panel’s chairman and ranking Democrat the power to issue subpoenas when they think it’s necessary. NBC News reported on Tuesday that the request letters sent to Cohen were the same ones sent to former Trump aides Carter Page, Roger Stone, Paul Manafort and Michael Flynn. Last month, Cohen defended the president’s relationship with Russia, saying in an interview that Trump is reducing tensions between the United States and Moscow. Trump on Tuesday said Russian officials are likely “laughing” at the U.S. amid continuing reports about the Russian election meddling. Speaking at a campaign rally in Munich, Merkel came to the stark conclusion that Europe’s alliances that have held together much of the West after World War II “are to some extent over. This is what I have experienced in the last few days.” Although Merkel never mentioned Trump by name there was little doubt she referred to him in the speech in which she also said that Brexit meant Europe could no longer count on its traditional allies. President Trump took aim at German trade practices and defense spending Tuesday following pointed criticism from Chancellor Angela Merkel that Germany may not be able to rely on its allies. Last week, White House spokespeople had denied that Trump criticized German trade practices after the German newspaper Der Spiegel quoted him as having done so. Trump unsettled Merkel and other allies during the recent NATO summit when, during his remarks, he did not mention the central commitment members of the North Atlantic Treaty Organization make to defend each other. In a 2014 meeting, NATO defense ministers agreed that each state would move toward a goal of raising military spending to 2% of its annual economic output by the year 2024. German defense spending is below that goal [in 2017]. The U.S. trade deficit with Germany shrank to $65 billion in 2016 from $75 billion the year before. Peter Baker of the New York Times fact checked Trump. Trump Says NATO Allies Don’t Pay Their Share. Is That True? Things are not quite as Trump describes them. You’re shocked, I’m sure. UPDATE: The Washington Post’s fact checker Glenn Kessler awards 4 Pinocchios for Trump’s claims on NATO funding. Putin is getting exactly what he wants — undermining the European Union and undermining NATO — from his puppet Donald Trump. 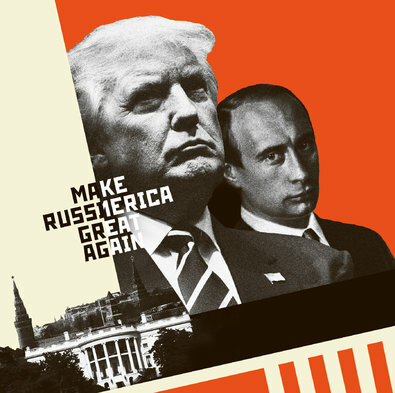 He may eventually get his goal of the lifting of U.S. sanctions on Russia for its invasion of Crimea and Ukraine, and for interfering in the U.S. election. And he is making American democracy look like a disaster to the world in the process. Oh yeah, the Russians are laughing at the U.S. alright. They can’t believe that enough Americans were actually gullible enough to elect this grifter and con man president. Russia’s President Vladimir Putin says the allegations of Russian meddling in the U.S. presidential election are “fiction” invented by the Democrats in order to explain their loss. In an interview with French newspaper Le Figaro, Putin reaffirmed his strong denial of Russian involvement in the hacking of Democratic emails. The interview was recorded during Putin’s Monday trip to Paris and released Tuesday. That sounds so familiar. Where have I heard it before? Oh yeah: “Russian officials must be laughing at the U.S. & how a lame excuse for why the Dems lost the election has taken over the Fake News.” That’s the president of the United States. No puppet. No puppet. You’re the puppet. Does that also include violating the Attorney/Client privilege if it is convenient for Democrats to do so? One can only imagine the hue and cry that would go forward at the mere suggestion of doing the same to Obama, regardless of the charges being levied. Double standards are a basic tenet of Democrat politics. You see, we don’t actually know what the NATO are thinking, but our guesses are good as reality. Never mind that the reason for the leak, like nearly all the leaks, is a group of people trying to bring the Trump Administration down and are willing to sacrifice national security for cheap political points. Of course, this too is just our opinion, but you should treat it as a fact because we hate Trump and you should hate Trump, too. Sometimes, AzBM, when you post messages like this, I think that about you. You faithfully continue to publish opinions, rumors, and hearsay on Trump and the Russians as if it is fact. Attorney-Client privilege only applies to a representative capacity in a legal matter. It does not extend to Mr. Cohen’s political role on the Trump campaign nor his new role as deputy national finance chairman of the Republican National Committee. I did not know that. Thank you for clearing it up for me. I am sure the voters of arizona want to talk to trumps lawyer right? WRONG! SSDD!